“When Prof. Ayrton and I were appointed the first professors of the City and Guilds of London Institute we found ourselves in complete agreement that we would have nothing to do with teaching for examinations. Rightly or wrongly the examinations now have a central role in most (all?) teachers' and students' lives. The syllabus is written so that it is clear what can be examined (NoS, Understandings, Applications and skills and perhaps International-mindedness) and the exams are written using command terms which are commensurate with the level of objective being tested. The pressure is heavily on students to achieve certain high grades in order to continue into higher education. 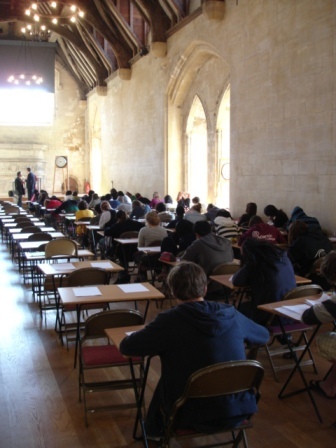 This part of the Website looks at every aspect of external examinations. The first section on Essential facts defines precisely the meaning of command term and explains the different levels of objectives. It covers grade descriptors and explains how the component grade boundaries and overall grade boundaries are arrived at together with figures giving the percentage of students attaining each grade. The next three sections then look at each of the three written papers in turn with concrete advice to give to students as to how to prepare for the exams and what the common pitfalls in each paper are. Examples of brand new questions together with the worked answers are given for the Section A part of Paper 3 covering data response and experimental work are provided. Finally there is a section on the whole examination process. This includes how the paper is actually written, marked, moderated and graded followed by advice on how to give predicted grades and feedback on the exams to the IB and when and how to apply for a remark.